The main difference between these two lapel pin types is that the hard enamel process fills the pin level to the surface with paint. Soft enamel pins coat the base metal only and use lot less paint. Soft enamel costs less as well. The main advantage to the soft enamel pin process is the ability to dye the base metal any colour. This has been the biggest innovation in our industry in our 47 year history. For this reason a lot of artists and designers prefer this process. The main advantage to the hard enamel pin process is these pins have the look and feel of "quality". This process is often used for uniforms, logo pins and employee service awards. This process was developed in the 70's to replace Cloisonné ,which is a glass based enamel that was used prior to the invention of epoxy enamel. Paint Level With Surface Which Some People Equate With "Quality"
If you are enamel pin designer who is seeking higher margins in your online store, pick this process. Company logo pins and sport trading pins are also common users of the soft enamel process. If your application is for years service programs or corporate promotion, go for the hard enamel if you can afford it. There is defiantly a "wow" factor with the hard enamel process and it avoids any perception of being "cheap". Pins are comparatively cheap to other award products like plaques and trophies. Both hard and soft enamel pins are made using the "Die Struck" process. That means we stamp them out of metal. Your design is engraved into a steel mold. Then a strip of zinc alloy is placed over top of the mold and a hydraulic press applies thousands of pounds of pressure so that its rendered with crisp and clean lines. Soft and hard enamel pins are stamped the same way: The Die Struck Process. Once that is done, we decorate your pins. There are two ways in which we add colour to your customized pins. 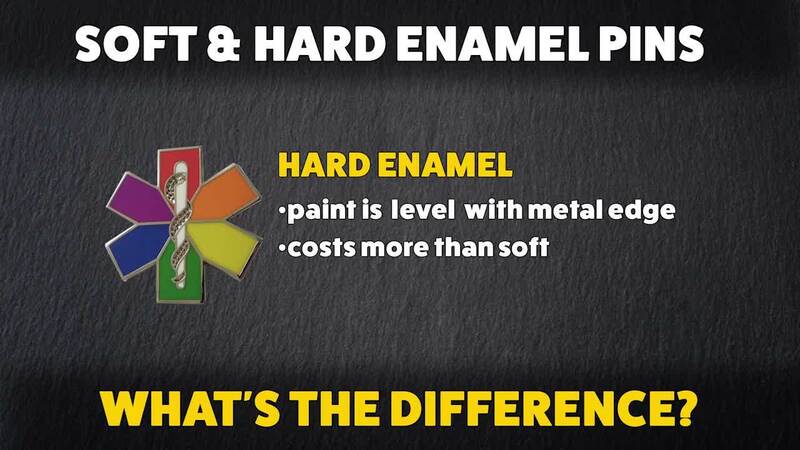 A liquid epoxy paint is injected into your pins.Either hard enamel or soft enamel. They both dry quite hard but on the soft enamel version the paint is much thinner. Hard enamel pins are made with the paint level with the surface. Soft enamel pins are about 40% cheaper that hard enamel pins depending on the quantity you buy. They use less paint, less metal and weigh less so shipping costs are lower. So it boils down to personal preference. Chances are the pin recipient, won't be able to tell the difference. Sometimes you are forced to use one process over the other because of the art. For example, black dyed nickel (the most popular electroplate with artists) is only available in soft enamel. If you want to silkscreen details over epoxy or require engraved numbers or text, you might have to use the hard enamel process. Our advice: don't get your heart set on one process over they other until you talk to us first.